It’s worth mentioning here that these principles are equally applicable to any medium. Some of my favourite typefaces look dreadful on screen; and even good typefaces like Georgia or Verdana, designed especially for the screen, often look at best mediocre on paper. Choosing type for the web is easier owing to fewer choices; however, that’s beginning to change. We now have sIFR and ‘web fonts’, so it’s all the more important to think carefully about the type we use. Is Times/Times New Roman—narrow set and designed for narrow columns—really appropriate for long-line extended text on screen? Probably not. There is a place for considering the historical context; however, it would be wrong to stick rigidly to this method of choosing type. If you’re setting a text on Neanderthal man, you’re going to run into problems. (seeThe Elements of Typographic Style, chapter 6.3, for excellent coverage of this particular topic). On the other hand, if your only audience is the BAF (Blackletter Addicts Foundation), then perhaps blackletter is appropriate. Who will read your beautifully set text? Scientists, lawyers, engineers, echo boomers, children? If it’s not obvious from the text, then find out. Historical ligatures may not go down too well with pre-school kids. In future articles we’ll look at specific case studies, and examples of serif and sans serif typefaces that work well together, together with a list of my favourite typefaces. Perhaps you have your own methods for choosing type. If you do, then be sure to share them in the comments. Typography for the Web has come a long way since Tim Berners-Lee flipped the switch in 1991. Back in the days of IE 1.0, good web typography was something of an oxymoron. Today things are different. Not only do we have browsers that support images (gasp! ), but we have the opportunity to make our web pages come to life through great typography. Pale pink text on a pale blue background, might match your t-shirt, but it just doesn’t read well. Text exists to be read; make sure that it contrasts enough with the background to achieve that. If you’re ever unsure about contrast, then take a screen dump of your page, open up your image editing software and reduce the image to grey-scale. You’ll soon see if you have enough contrast. 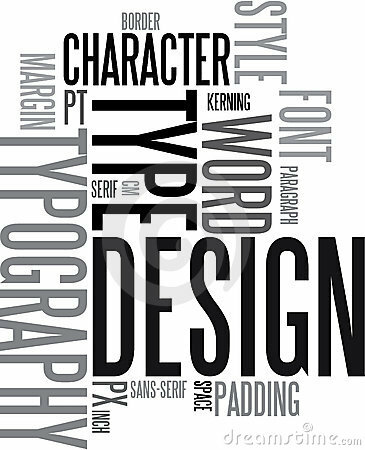 Robert Bringhurst, the consummate typographer writes, typography exists to honor content. Are we honouring the content, if we design our pages in such a way that the text, the content, is difficult to read? With the birth of Web 2.0 I noticed a rather annoying trend; namely small type. I’ve even emailed site authors and kindly suggested that they increase the default font size. I’ve received mixed replies from, tough, get yourself some glasses to thanks, I’d never even considered that my type might be too small for the average reader. I’ve even heard tiny body text defended with, “it matches my minimalist design”, or similar. It most likely reflects a small something else. Unless Super Man and 20/20 Vision Girl (Marvel Comics, keep your hands off, she’s mine) are your only readers, then small type is just not on. Don’t set body text below 10 or 12px and, if possible, make it bigger. Remember, what’s legible on your 65 inch High Definition Plasma monitor, might not be so on a 15 inch MacBook. If in doubt, make it bigger. The body text on ILT is set at 16px. Varying type size is one of the best ways to differentiate content. Colours and pretty boxes might help, but different sizes of type, used consistently throughout your pages, will signal loud and clear to your readers the relative importance of your pages’ elements. It also means that if your readers are in a hurry, they can quickly pick out the important bits — and that could mean that they stay longer and read on. Hierarchy can be achieved in other ways too. We’ve just mentioned using different sizes of type to achieve it, but we can also use different styles; for example, all-caps, or using italic for sub-headings. Serif and sans serif faces can also be mixed to good effect. Let your type breathe. Don’t be afraid to leave blank spaces in your pages. This negative or white space will help focus attention on the text—and it’s the text that speaks loudest, so let it be heard. Next, remember the line-height CSS property; a good rule of thumb is line-spacing that’s at least 140% of your text size (remember, I’m writing about web typography here). Good type designers put a whole lot of effort into the micro white space that sits inside type. They spend countless hours attempting to achieve a balance between the black of the type and negative or white space that it envelops. Likewise, we should take time to consider the macro white space, the ‘voids’ that shape our blocks of text. Remember, these are not rules, but rather guidelines. However, follow them—contrast, size, hierarchy, and space—and your typography will rise like one of Gordon Ramsay’s Soufflés. Oh, and I was only kidding about the monkeys. In a future three-part series on the fundamentals of typography, I’ll look at all of the above in more detail. I’ll also be discussing numerous things (details) that will go a long way to improving your typography both on- and off-screen. Alex is a widely respected typographer, illustrator and designer from Spain with a very impressive list of clients. His work is diverse and imaginative and well worth a look. Bianca currently works at Mark Gowing Design in Sydney and does lovely 3D layered paper cuts for exhibition. 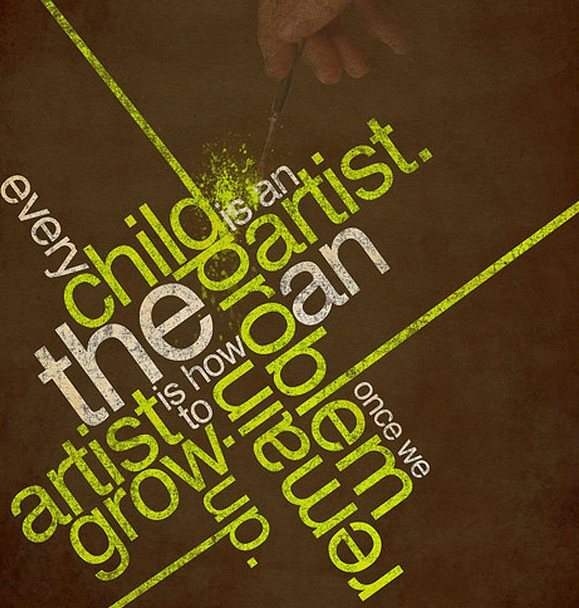 Craig is most well-known for his “Bad typography is everywhere” poster, but I love this roots piece. It’s amazing. Evelin works in cross stitch, CMYK cross stitch to be precise. Her work emulates the four colour printing process using thread on paper and I absolutely love it. Jonathan is an Australian artist and designer with a diverse range of styles and techniques. His site is divided into commercial and exhibition work. Yet another designer to straddle the fine line between designer/artist. Luca does fantastic live calligraphy performances. I would love to see one. Marcelo’s digital 3D typography is so full of energy and life and always feels like it’s bursting out of the page. Me and my pen is Darren Newman, typographer and illustrator who works in a very linear style. A video of Niels was doing the rounds recently of him doing calligraphy on the ground with a wet broom. One of my students listed him in all five of their top 5 slots and said he would give his face to be this talented. Says it all really. Judging by his work, Oded is one wacky guy. His projects are highly creative and imaginative. Polish designer Peter Tarka has a wide variety of 3D design work, packed with energy and edge. RIPO is a graffiti artist who works in a wide variety of styles and sizes. Sean Freeman is a highly creative commercial designer from the UK who always surprises with his type treatments. His studio is called THERE IS. Sepra4Life is Marko Purac, a Serbian cartoonist and typographer who has a structured, retro cartoon style. Si Scott is an illustrator and typographer with a very distinctive and specific linear style. Simon is a Swedish designer obsessed with two things: type and coffee. He has a very distinctive style and is fantastic at hand lettering. YLLV is Karol Gadzala, a Polish typographer and illustrator. Alex Trochut is a typographer and graphic designer based in Barcelona. He has been working as a freelancer since 2007 and has gained clients such as Pepsi, Wallpaper* and Audi. His experimental style has gained him critical acclaim from across the board and with a philosophy of ‘more is more,’ his array of work is a perfect example of embracing the endless spectrum of font formats. Tomasz Biernat specialises in old school lettering – often recreating those custom typefaces that hark back to chalk boards and elaborate calligraphy. His typography has been seen on prints, posters and t-shirts as well as bigger installations. In my research and process to define energetic splatter, I started out by defining them as one “energetic splatter”. I started by typing these two words in Google together to see if it would be more creative verse the words by themselves. But I also researched each separately. I found they were more successful combined verses independently. The pictures I found as the two words together were more creative and interesting. When I think of energetic splatter I see energetic splatters of paint and bouncing balls. When thinking of energetic I feel full of life and alive and when thinking of splatters I see abstract colorful art of splattered paint. When creating the modules my process was to make them look like there was motion, and I thought that using circles would be the best source to create motion or give the impression of motion.